Posted on Sat, Oct 1, 2011 : 7:05 p.m.
Michigan running back Vincent Smith (2) celebrates after scoring the Wolverines' first touchdown of the day on a 2-yard run. Smith finished with a rushing touchdown, a receiving touchdown and he threw a touchdown pass. Michigan junior running back Vincent Smith does a lot of things for his team. On Saturday, he took that up a notch, accomplishing a feat no Wolverine has since at least World War II. The 5-foot-6, 172-pounder ran for a 3-yard touchdown, caught a 28-yard scoring pass and threw for a 17-yarder on a halfback pass in Michigan’s 58-0 win over Minnesota. It was the first time a player has ran, thrown and passed for a score in modern Michigan football history (post-World War II). 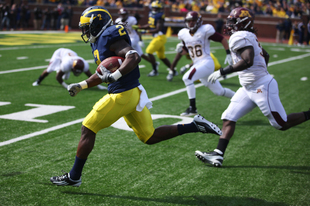 Vincent Smith races toward the end zone on a 28-yard touchdown reception from Denard Robinson. Entering the season, Michigan coach Brady Hoke dubbed Smith as a hard-nosed player that would likely occupy the role of third-down back this season. Smith’s done that part just fine, but he hasn’t stopped there. Through five games, the junior has run for 206 yards and two touchdowns, has caught six passes for 98 yards and two scores, and now, has added a passing touchdown to his resume (the first non-quarterback passing touchdown since receiver Adrian Arrington hit Mario Manningham for a score at Illinois in 2007). “He does everything you want him to do,” Hoke said. “When you look at him as a football player and how he prepares and his toughness and all those things, Vince is a guy that you know you can count on. The question of who the team’s featured running back will be this season has likely been answered over the past two weeks by the play of Fitzgerald Toussaint, who eclipsed the 100-yard mark for the first time in his career Saturday. But that doesn’t lessen Smith’s accomplishment, or his value. Michigan junior guard Ricky Barnum and senior fullback John McColgan sat out Saturday’s game due to injury, while sophomore cornerback Terrence Talbott and junior running back Michael Cox sat out for unspecified reasons. Barnum had started the previous three weeks at left guard, but was held out of practice last week after suffering an apparent leg injury against San Diego State. He was replaced in the starting lineup by sophomore Michael Schofield. Sophomore running back Stephen Hopkins took the majority of snaps at fullback. Senior cornerback Troy Woolfolk limped off the field during the fourth quarter and did not return. Hoke said he was unaware of any injury to Woolfolk. Both injured linebackers Cam Gordon and Brandon Herron dressed Saturday. Herron played for the first time since the season-opener, while Gordon did not play for the fifth straight game. Michigan junior quarterback Denard Robinson played Saturday with a heavy wrap around his right elbow. Asked why the wrap was there, Robinson offered little explanation. Hoke, who has offered little to no insight on injuries this season, gave the exact same response when asked about his quarterback’s elbow pad. “Denard had a boo-boo,” Hoke said. Michigan made a slight alteration to its game helmet Saturday, as each player sported his own number near both ear holes. The Wolverines wore numbers on their helmets earlier this season during the “Under the Lights” game against Notre Dame. “That was my decision,” Hoke said. “We will have those numbers on there throughout the rest of the season. After starting the week in the hospital due to recurring seizures, Minnesota coach Jerry Kill was on the sideline Saturday in Ann Arbor. Kill, a former Saginaw Valley State coach, left a game earlier this season due to a seizure, and didn’t join the Golden Gophers on the practice field until Wednesday. Despite all that, Kill said his absence earlier this week had no effect on his team’s poor play. “They knew I was going to travel,” he said. “I don’t know what you read, I don’t read what’s out there. I don’t read the paper, I don’t read the blogs. I was coaching. I missed one practice, that’s it. With three field goals Saturday, sophomore kicker Brendan Gibbons now has as many field goals through five games this season (four) as Michigan did as a team last year. Gibbons connected on kicks of 25, 32 and 38 yards Saturday. He is 4-for-5 on the year and 24-for-25 on extra points. Michigan sophomore punter Will Hagerup returned from his four-game suspension Saturday. Hagerup punted twice, averaging 37.5 yards per kick. Freshman kicker Matt Wile had been punting, but just handled kickoffs Saturday. Former Michigan quarterback John Navarre was honored during the first media break of the game. Saturday marked the third straight game that Michigan has rushed for 300 yards as a team. The Wolverines finished with 363 Saturday, 320 against San Diego State and 376 against Eastern Michigan. Tue, Oct 4, 2011 : 4:48 p.m.
Give Gardner a chance.Make D Rob any all purpose Percy Harvin type of back.D Rob is not a good enough passer to be fulltime QB against the better teams.The Creampuffs so far r one thing.MSU,Nebraska,Wisconsin,Illinois,Northwestern,and OSU are something else. Tue, Oct 4, 2011 : 4:39 p.m.
let's see what he does the rest of the year. Sun, Oct 2, 2011 : 10:14 p.m. The Michigan offense is no one-trick pony anymore. How many starred in this game? Great job Vincent Smith. 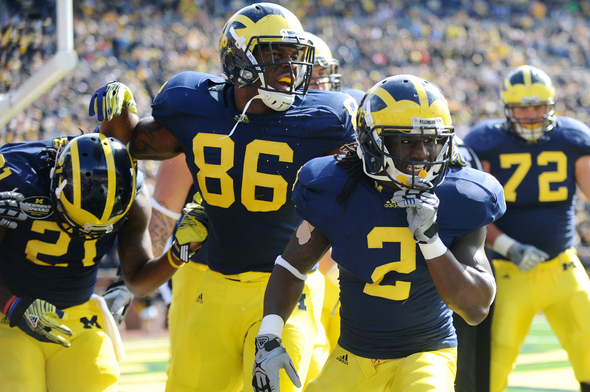 Let's hope that Brady Hoke does not feel that he has to leave Denard in too long in game when we have a sizeable lead. We might need him to play more next weekend and the week after if these games are close. Very impressive to see we have to go back to the Bo era to match some of these stats. Sun, Oct 2, 2011 : 3:51 p.m. I sure hope Denard's boo-boo gets all better. Sun, Oct 2, 2011 : 1:46 p.m. I was surprised to see DG and DR together early. The offense had alot of swagger. The Defense contiunes to grow. Hoke is 5-0 in his first year already. This team is different, I am tiered of the news questioning if it were not! Go Blue, Beat OHIO! Sun, Oct 2, 2011 : 11:04 a.m. This is the reason why Michigan should use multiple RB's in their arsenal. Toussaint can do some things and Smith can do some things others cannot. It is the advantage of the team to use many weapons to have a complete offensive attack. Denard Robinson left center an right all season long will not work as last year, get different RB's involved in the game, get Gardner for the Denard in the backfield look in the games for a change of pace. This Michigan team as a team is more powerful than Robinson alone. Sun, Oct 2, 2011 : 2:43 a.m. The home jerseys look so much better this year than the previous adidas version which looked odd and mis fitting... the helmet numbers look cool too. Tue, Oct 4, 2011 : 12:09 p.m. I'm not a fan of the Block M above the names, personally.